Endemic species play an important role in conservation ecology. 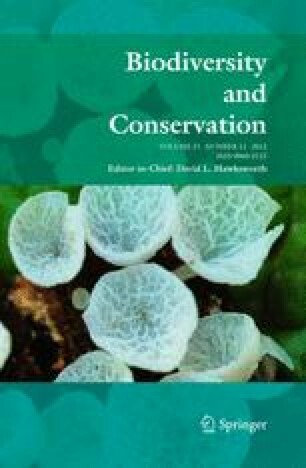 However, knowledge of the real distribution and ecology is still scarce for many endemics. The aims of this study were to predict the distribution of the short-range endemic Alpine jumping bristletail Machilis pallida; to evaluate the actual level of endemism via ground validation using an iterative approach for testing the models in field trips and increasing the quality of the prediction step by step; and to test the potential of species distribution modelling for increasing the knowledge about the ecological niche. Based on seven known locations of M. pallida, we used species distribution modelling via Maxent. After a set of seven field trips a new model was built if new locations were found. Three such iterations were performed to increase model quality. We discovered four new locations of M. pallida, increasing the area of known distribution from 470 to 4,890 km2. The distribution of M. pallida is thus wider than formerly known, but our results support Eastern Alpine endemism of the species. The knowledge about the ecological niche could be increased due to the newly found locations. Our study showcases the potential of the iterative approach of modelling and ground validation to evaluate the actual level of endemism and the ecological niche in Alpine species and beyond. Florian M. Steiner and Birgit C. Schlick-Steiner contributed equally to this work. We thank Thomas Beswick, Paul Donovan and Dominik Rinnhofer for help with field work, Clemens Folterbauer for assistance in the molecular lab, Edward Middleton and Gary Muir for linguistic revision, and an anonymous reviewer for valuable comments on the manuscript. We also thank Tyrolean, South Tyrolean and Swiss authorities for granting sampling permissions and the Federal Institute for Geosciences and Natural Resources in Hannover, Germany, for giving access to geological data. The University of Innsbruck covered LR’s travel costs; NR-P was supported by project Consolider Montes (CSD2008-00040) granted by the Spanish Ministry of Research, Science and Innovation (MICINN), TD by the association in aid of South Tyroleans at the University of Innsbruck, GAW by project 32.06/138020 granted by the Autonomous Province South Tyrol, and FMS by project P 23949-B17 granted by the Austrian Science Fund (FWF).